A retirement party on December 3 will celebrate Jacqueline Calhoun, who can claim illustrious careers both in the NIST laboratories and in its extramural programs, namely at the Baldrige Performance Excellence Program. To have worked with Jackie, is to have known professionalism, a quest for learning, performance excellence through attention to detail and desire to do a project right, and overall kindness. If you want someone to represent your program or ensure the highest level of integrity in every project or process, then Jackie is the coworker to whom you turn. And for those of us who have had the pleasure to work with her, we also call her our friend. Please tell me about your most memorable experiences working at NIST. Working at NIST was my very first job. I was excited to have the opportunity to work in a laboratory setting—I was also intimidated, yet eager to learn. I came to NIST as part of a special fellowship program for high school honor students who wanted to work in an area that would closely resemble their chosen careers. I planned to major in pharmacy when I started college, and NIST, which was the National Bureau of Standards (NBS) at the time, was just starting a radiopharmaceutical standards program. For me, it was a perfect fit. After touring the campus and the laboratory where I would work, I knew NIST was the place for me. When I first started, I was too young to work in the radioactivity laboratory; however, I had a great supervisor who prepared me. He taught me about laboratory procedures and techniques, and the importance of safety. During the first summer, I washed lots of labware, made distilled water that would be used by the scientists, and learned how to complete a lab report and important lab-related calculations. I could not wait until the day came for me to go into the lab. When it came, I recall receiving my first white lab coat and steel-toed shoes for safety—such a small thing now, but to a young woman, who never had a job before, and who was still dreaming about what she would do in the future, this was a big deal to me. 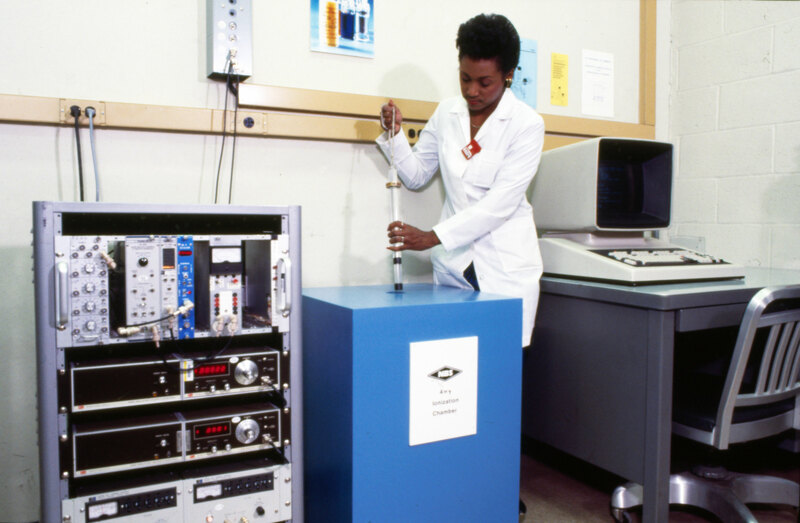 After graduating from college, I was hired as a NIST physical scientist and went on to have many wonderful experiences, including conducting extensive radioactivity measurements, preparing radioactive samples for measurement, serving as a project manager of the key radioactivity standards, traveling internationally to exchange measurement techniques with other laboratories, and having the opportunity to publish my work. In 1998, I received the “Top Women in Sciences Award,” which was a total surprise to me and helped me to fully realize my accomplishments in the lab. Please tell me about your most memorable experiences working at the Baldrige Program. I have many memorable experiences in the Baldrige Program, so it is very difficult to be selective. 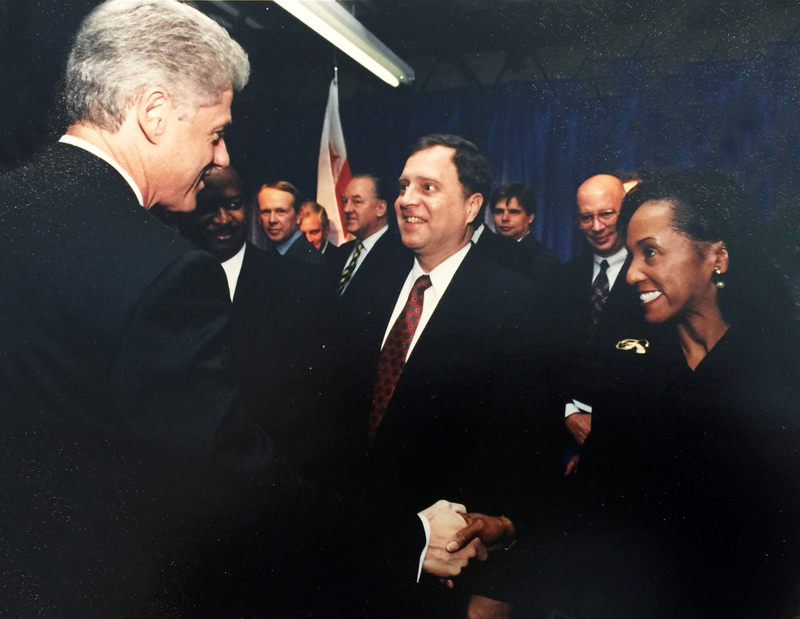 I have always enjoyed the Baldrige Award ceremony events and I had the opportunity to go into the holding room with one of our U.S. Presidents. I shook his hand, and at the time, this was significant for me; I never would have imagined this experience. I had the opportunity to work with and learn from some very accomplished people, including our Baldrige examiners, judges, overseers, and, of course, the Baldrige staff. I had the opportunity to work on the Baldrige Criteria, the centerpiece of the program, and I am ending my career, having had a unique opportunity to work on a new initiative—Baldrige Cybersecurity. Collectively, these meaningful experiences have strengthened and challenged me, cultivating what it means to work towards excellence. I also had the honor of representing the program on a rotation assignment in the NIST Program Office, supporting the work of the NIST director. I worked with a team of scientists to write a NIST publication, “An Assessment of the United States Measurement System: Addressing Measurement Barriers to Accelerate Innovation.” During my time at NIST, I also served for two terms as an EEO Counselor, was the NIST representative for the Federally Employed Women’s Program, and was the coordinator for the NIST People Council, one of the strategic planning committees focused on the needs of the NIST workforce. What are you most proud of during your career? This is a tough question. Overall, having a career at NIST has been a wonderful experience, and it is difficult to pinpoint the one thing that I am most proud of. When I was in the lab, I thought that publishing papers was what I was most proud of, as well as receiving the “Top Women in Sciences Award.” In the Baldrige Program, it has been an honor to have had the opportunity to work on what is considered to be the program’s intellectual property, the Baldrige Criteria. What advice or words of parting might you give to your coworkers? What do you look most forward to in retirement? I am looking forward to traveling and having more time to spend with family. My granddaughter, Emma, already has some things planned for the two of us to do together. I also plan to volunteer more at my church. I enjoy reading, and I have lots of books on my list to tackle. I heard a quote once by Fred Rogers: “Often when you think you are at the end of something, you’re at the beginning of something else.” I look forward to beginning a new chapter in retirement that will create new memories. Congratulations, Jackie! I wish you great fun in your retirement. Steffani- Thank you very much! It was a pleasure and privilege to work with you over the years. All the best on your retirement. It was a pleasure to work with you as well. Thank you! I can't imagine the program without Jackie! She's a consummate professional and source of knowledge who will be missed. Best wishes, Jackie, for a wonderful retirement! Thank you for the kind words and farewell wishes! It has been a pleasure to work with you. Jackie was my NIST monitor on one of the first site visit I ever led. I don't think I would have survived without her! She solved every problem quickly and with a smile on her face. She is the ultimate professional. Thanks, Jackie for everything you have done for the Baldrige program and for me personally. I will miss you, my friend. Congratulations on your retirement. It was a pleasure to work with you. Thank you for your kind words and recognition of my retirement. I appreciate your friendship. What a great tribute to a great lady, whom I was privileged to learn from as a colleague. Jackie is indeed the epitome of class, kindness, strength, poise, and professionalism. Congratulations on a fulfilling career and exciting adventures ahead! Thank you for the very kind words my friend. I enjoyed the time we worked together. Congratulations Jackie. It has been such a pleasure working with you. I will miss your beautiful smile each year at training. Enjoy this new stage of your life. I humbly say thank you. I sincerely appreciate your generous words. I'm honored to have worked with you, Jackie! You have made a great impact on NIST and Baldrige (and the nation!). Good luck on your transition, and I wish you great happiness in the next phase of your life! Thank you for your compliments and good wishes! Thanks Jackie for sharing your time and talent with NIST and Baldrige! You're an inspiring role model for all women and would-be STEMs. Enjoy your time. I humbly thank you for your kind words. Congratulations, Jackie! I will miss working with you. Thank you for all your support through the years! Jackie, You are one of a handful of people from the Baldrige Program that I remember vividly from my days as an examiner. You, your colleagues, and the Baldrige Principles truly had impact on the quality of K-12 education in the school systems where I worked during and after the professional development I gained through you! Thank you, and enjoy the next phase. Thank you for the kind and generous words. We sincerely appreciate you sharing your time and talent with Baldrige. You are an awesome young woman with a very bright future and I appreciate your kind words. Mere words cannot suffice to convey my respect of and gratitude for you. From way back when we met in August 1994 through this year, you have always been inspiring and such an esteemed role model. A pro’s pro is a great descriptor, but so are the terms integrity, excellence, leader, doer, extreme contributor. Thank you for your contributions to NIST and being a key part of the Baldrige Performance Excellence Program’s historical fabric. Thank you, colleague, thank you friend. My very best on your new chapter. It was my honor and pleasure to work closely with you on many projects at BPEP. The program will be feeling your loss for a long time. I wish you all the best in your retirement. Congratulations on an exceptional career and the start of a whole new, enriching life. Thank you very much. It was a pleasure to work with you as well and we miss you here in the office. I have many fond memories of our days together in Baldrige. Congratulations, Jackie! It was an honor and a privilege, not to mention a real pleasure, to have worked with you on the Baldrige Program for so many years. Enjoy the new adventures in your life and please keep in touch!